The Elk River in south central Tennessee is a very popular fly fishing destination for those living in the Middle Tennessee and Northern Alabama areas. 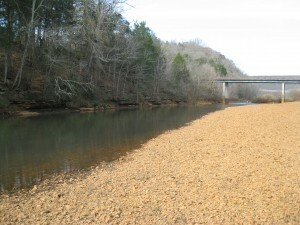 In fact, it is one of the first rivers I fished in Tennessee. It is a calm river that never moves too fast, but just fast enough to move a food supply around for some hungry trout that reside there. Parking and access are easy to handle, which has its ups and downs, getting you to the river, but also getting everyone else to the river as well. The Elk does get a lot of pressure at times, but overall, it has been a resilient fishery. This year has seen much warmer water temperatures downstream due to a program in place to protect a species of mussel and darter that are native to the river. From my findings, the trout stayed further upstream toward the dam and colder water, and fishing declined some, but the Elk pulled through nonetheless. The Elk has produced some very quality fish, and provides anglers with a number of situations to use a variety of flies. From midges to attractor patterns, you can get some use out of flies that utilize the entire water column. To check the release schedule for Tims Ford Dam over the phone, call the lake information line at 1-423-751-2264 and press 4 for predicted units. you will then be prompted for the two-digit number for the dam, which is 50. Always check the generation schedule before you leave for the river, and also right before you get in the water. your travels will take you through Lynchburg, and a stop at Tims Flies and Lies will be in order. The shop is just off the square, you can’t miss it. Tim and his wife are always helpful and willing to share information. check out the fly selection they have, there are some very productive patterns for the Elk as well as the Duck River. (you can check out Tim’s website by clicking the link on the right side of the page) If you havent eaten, the Iron Kettle is a regular stop for us, it is on the square just a short walk from the fly shop. Once you get through Lynchburg, it is off to the river. The most popular access point is below Tims Ford Dam. there is a parking lot and ramp that leads down to the gravel bank, so launching a boat is possible. Once you’re geared up, just hit the water and start prospecting. Fishing is good below the dam and close to the parking lot, but if you want to put a little distance between yourself and the road, there is a foot path that goes along the bank that takes you to different spots. Rod: a 5wt is the most popular rod used on the Elk, and better for a number of different flies. Overall this is the most versatile size rod you can use on this river in my opinion. From dries, nymphs, and streamers, you can cover all your bases with a 5wt. We use a variety of rods, dad likes to play around on a 2wt, and I will use a 3wt to get that ultra light feel as well. a 12 inch trout on a 2wt feels like a carp. Leader: The fish in the Elk arent too leader shy, they are more worried about presentation, so keep it simple, 5x will do fine. Flies: Feel free to experiment on the Elk, but don’t forget the basics. Zebra midges, pheasant tails, Hares ears, soft hackles, the occasional dry (Para Adams) and wooly buggers should be staples in your box. I could give more details, but come on, finding the details is half the fun, get out there and fish! Wading/floating: same as anywhere else, be careful!! always check and re-check the generation schedule before you get in, and pay attention to the water levels while youre fishing. Click the TVA link on our homepage and check Tims Ford Dam to find the most recent release schedules that will affect the Elk. The river can easily be floated in a canoe, kayak, or pontoon, and smaller jon boats are also a possibility.